Fear has driven me to hide in a room with only one exit. A mutilated Doctor wants to remove my remaining fingers without anaesthesia. I barely see the Doctor enter the room from my vantage point under a hospital bed. His oversized scissors make noises that pierce my eardrums, cutting through my fading sanity. Maybe he will stop searching and move to another room? I receive my answer when he looks under a nearby bed. It is only a matter of time before I am found. I gather enough courage to make a dash for the exit, but the good doctor sees me hurdling beds and gives chase. Upon reaching the exit, I turn and lay eyes on his gruesome, leathery exterior before slamming the door in his face. The door will only delay him, so now I run. Outlast is the latest horror sensation to grace the PC platform. Developed by an independent studio, Red Barrels, it puts players in vulnerable positions and forces them to run, hide or die. Players assume the role of an investigative journalist, Miles Upshur, who has been given information about gross medical negligence at Mount Massive Asylum. Miles plans to uncover the truth behind the horrors at this mental hospital. He chooses to find the truth alone, at night, just as a storm moves in. After finding a way into the Asylum, he realises that patient survival rates are well below average. Miles brought a video camera with him, but he had no idea how crucial it would be for survival. 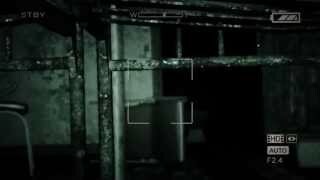 The camera’s night-vision can see what your eyes will not, and this is vital given the many dark areas within the Asylum. The night-vision range is limited, so you must feel your way through areas. Walls and deranged mental patients will come into view as you inch forward. Zooming penetrates the darkness more, redefining a disrobed mental patient, but it restricts your peripheral vision. The camera uses batteries, draining significantly in night-vision mode, so you need to constantly monitor the power level. Without power, escaping an attacker in the dark is clumsy and dangerous. The video camera becomes the primary window to the horrors that await you. During the first half of the game, the focus is about staying hidden. You might need to enter a room, but it is occupied by a vicious mental patient. To get inside you will need draw him away, or wait for him to leave, and then hide from his wrath. You can hide in lockers, behind desks, or under beds to avoid being detected. Your pursuer may scan the area, search a locker, and leave empty handed. This mechanic becomes repetitive due to structure. When you enter a room, you will take note of hiding spots and not necessarily the rich environment. When you hear Miles breathe heavily, you know enemies are close. As Miles suffers his tenth panic attack, you wait patiently for a crazed man to leave so you can vacate the locker and continue forward. Um, well, I never wanted to go that way anyway! The second half of the game is populated with longer foot chases that require you to quickly assess an area before proceeding. Closing doors slows your pursuers, and these daring escapes can be tense when enemies are on your heels. You can peak over your shoulder when sprinting, but it might damage your fragile mental state and obscure the only means of escape. Pushing rudimentary barricades against doors delays attackers longer, but the barricade placement is rigid. The mental patients are not always effective pursuers either. Some fail to chase longer than a few seconds, even when they were standing right next to you. You then spend a few minutes in another locker before realising nobody is coming. Despite this, chases produce great urgency and raise the adrenaline levels. The core mechanics in Outlast are simple, so it relies on frequent enemy encounters to keep the player occupied. In terms of objectives, you might need to turn on sprinklers to douse a fire, or collect fuses to activate a laundry chute. But these objectives force you to run and hide just as you have been doing all along. As you progress through each sub task, the potential danger might elevate. One heavy-set mental patient is a reoccurring threat, and he can knock doors from their hinges when in pursuit. While he can do some damage, he is not all that bright and can be avoided without much trouble. The game occasionally drops the pacing, usually not for long, before dragging you into another race for your life. Staggering the jump scares between the action is well balanced. When not dealing directly with mental patients, you will be creeping through offices, bathrooms or hallways. Here you will face unsettling noises and abnormal shadows. When wading through the sewers, a visual splash was more than enough to give my heart a jumpstart. Another scare was generated when a humanoid shadow appeared in a courtyard amidst a raging storm and vanished when the lightning ceased. These spooky elements, mixed with the excellent atmosphere, are a key part of the fear you will experience. Outlast is a good 4 hour horror experience, but it would stumble if it was much longer. The running and hiding mechanics become clinical after a few hours. It puts you in similar positions and gives you equivalent solutions. It would have benefitted from another element, or more depth, to keep players involved in the atmospheric world. Amnesia used puzzles, F.E.A.R. had gunplay and Condemned exploited crime scenes. Outlast does not have that contrasting element to create breadth in the horror experience. This certainly does not mean the game fails to terrify, because it succeeds quite often. If you are looking for harrowing experience, where you are vulnerable at all times, then Outlast is a fine choice. A good looking game from an independent team. Environments and shadows are particularly impressive. Has an engrossing atmosphere, which leads to excellent jump scares. Asylum files are not very interesting, and journal notes do not add to the experience. The world tells its own story quite well and there are memorable sequences. Takes around 4 hours to finish, if you can survive. "Constantly traumatic but rather mechanical in nature"
Outlast is ranked #709 out of 1435 total reviewed games. It is ranked #75 out of 158 games reviewed in 2013.